Countdown to a Thrilling Balloon Release at Noon at the Best Place in Westchester for Kids to Celebrate New Years Eve! For the 9th year in a row, New Roc City will offer their festive Ring in the New Year at Noon at New Roc City event for kids ages 2 – 10 in the atrium from 10:30 am – 12:30 pm. Parents and kids will enjoy an exciting Times Square-inspired atmosphere in a safe and fun environment. While the highlight of the event is always the thrilling count-down to a 3,000+ balloon drop at noon, there are also many other activities like face painting, arts and crafts, kiddy rides, clowns, magic, a singing princess, wheel of chance, games, snacks, goody bag, soccer, raffle prizes and much more! This year’s event will support the New Rochelle Library Foundation through a $10 donation per family of 4 when registering for the New Roc Event. The New Rochelle Library Foundation is a nonprofit organization that fundraises and advocates for the New Rochelle Public Library to keep it vibrant, up-to-date, and able to serve the diverse needs of the New Rochelle community. Funds raised by the Foundation support upkeep and improvements to the Library’s physical space, literary collections, equipment, and programs. The Foundation ensures the Library remains a safe and secure epicenter for knowledge and community for all residents of New Rochelle. 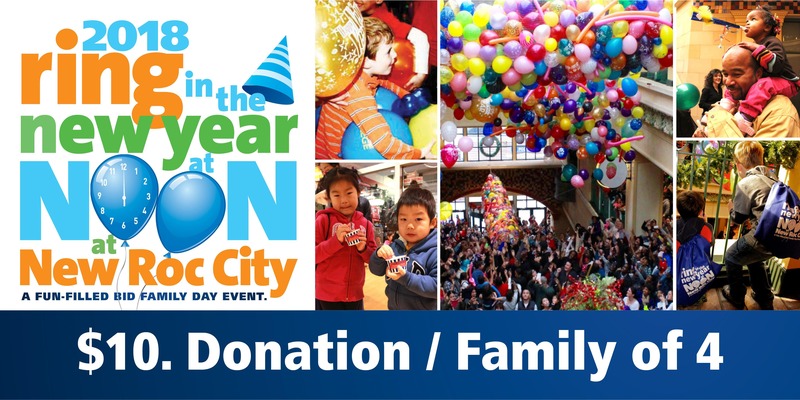 Ring in the New Year at Noon at New Roc City is geared toward children ages 2–10. Families are invited to spend the rest of the afternoon Downtown and at New Roc’s complex to complete their fun-filled New Year’s celebration. Please enter your email, register and download your Family Pass to the best family New Year celebration around.